MWC: AKG N20 headphones sport universal remote+mic for Android and Apple | What Hi-Fi? AKG claims the N20 headphones' three-button remote control and in-line mic is a "unique" universal proposition that will work with both Android and Apple smartphones and tablets. 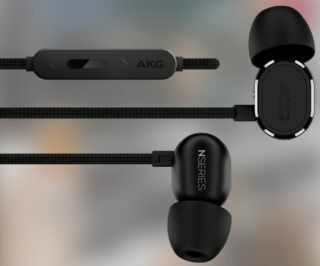 Launched at MWC 2015, the AKG N20 headphones are "Made for iPhone/iPod/iPad" certified for compatibility with Apple devices, while also promising support for Android phones and tablets. The N20 in-ear headphones have a semi-closed back design with an aluminum housing, and come with silicone ear tips in three sizes and a 1.2m tangle-free fabric cord cable. You also get the usual array of accessories such as a carry case, flight adaptor and a cleaning tool. The N20 in-ear headphones are due on sale in June, and we're told they will come with a £99 price tag (even though the AKG shop is currently showing them at £110 for the black pair and £80 for the earphones in silver). With the AKG Y50 on-ear headphones sitting pretty as our 2014 headphone Product of the Year, the N20 in-ears have plenty to live up to.